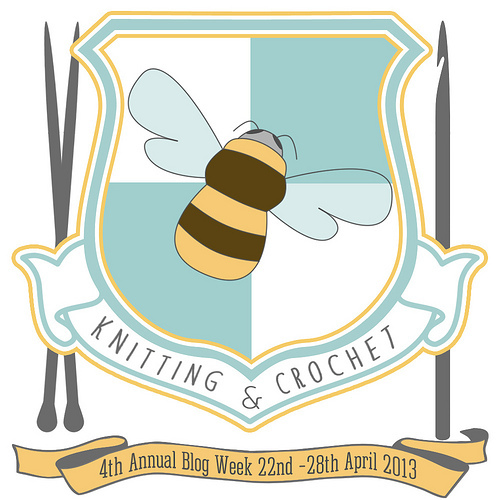 I hear it’s the 4th Annual Knit and Crochet Blog Week! And since there has been a great deal of radio silence over here (sorry about that! Life got busy and in the way of the fun stuff!) I decided this was the perfect excuse to get my keyboard back in action. The Houses are Bee, Manatee, Peacock and Monkey and each one has a different meaning. I have chosen as my house, The House of Bee. Bees are busy and industrious, but can flit from one interesting project to the next as bright and shiny things capture their interest. This is particularly amusing right now, as lately, I have found myself with the worst case of “start-itis” I have had since I took up knitting in any serious fashion some two and a half years ago. I currently have ten projects on needles, including four pairs of socks. Mind you, one project is a few yards from completed and some are in hibernation…but still! And I have several more projects I am dying to cast on. While I do occasionally learn new things, it’s not one of my main aims of knitting. I frequently cast simple stockinette socks and cowls…just to have something to knit to keep my hands busy, while requiring little to no real mental focus. The act of knitting, for me in any case, is meant to be a relaxing one. So, the Bee seemed to represent me far better than the curious Monkey, the complicated Peacock or the calm Manatee. This entry was posted in Uncategorized and tagged 4kcbwday1, knitting and crochet blog week by Rayna. Bookmark the permalink.